“The anise and nutmeg fragrance of the biscochitos, the traditional sugar cookies, filled the house,” reads “Christmas in New Mexico,” a heartwarming essay by Chicano writer Rudolfo Anaya, author of Bless me Ultima and Randy Lopez Goes Home. Though biscochitos are particularly popular during Christmas, they can be found any time of the year at many Taoseño restaurants. Originally from Spain, they were brought by the conquistadores to the New World and are now the official state cookie of New Mexico. Burritos (rolled flour tortillas filled with chicken, pork or beef, beans and chile) are also staples of both the Mexican and New Mexican cuisine. But the “smothered burrito” which is served covered on green or red chile sauce and melted cheese, originated in the American Southwest and isn’t actually known in Mexico. When I asked Raquel Troyce, a native of Guadalajara, if she knew how to make a smothered burrito, she thought I wanted to drown an unfortunate little donkey. Enchiladas are corn tortillas filled with chicken, beef or pork and also covered on chile sauce and melted cheese. They acquire a special New Mexican flavor—and color—when prepared with blue corn. And that takes me toOrlando’s, a local restaurant that offers the best blue-corn shrimp enchiladas in town. Orlando’s New Mexican Café has been voted Best Mexican Food inTaosCountysince 2005. It began as a small family operation in 1996 and today is one ofTaos’ most popular restaurants among locals and tourists alike. 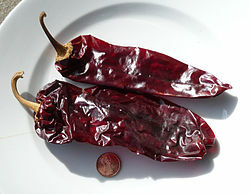 It is also home of the vegetarian red chile, made with a recipe provided by Delfina Archuleta, the owners’ grandmother. Patsy Vigil is a native Taoseña who has worked in the restaurant as a cook for 15 years. She is the owner’s mother-in-law. Chile is New Mexico’s largest crop. It is added to all kinds of dishes, from burritos to beans. It is grown throughout the state in places like Chimayo, Dixon and Socorro, but Hatch Valley farmers in particular are constantly developing new breeds. They tailor-make chilis and introduce them to the locals and consumers from all over the country as well as from abroad. The cooks at Orlando’s use three kinds of chile—caribe, red and green, or a combination of red and green known as Christmas. The degree of “hotness” depends on the variety, growth and stage of ripeness of the chile when it is picked, but caribe is undoubtedly the hottest one. Pozole is a stew made with hominy corn and may contain beef or pork. “But we offer it without the meat, so vegetarians can enjoy it,” said Vigil. And that is another important difference—the use of pozole as a side dish instead of Spanish rice, which adds a distinctive New Mexican flavor to the chile rellenos, burritos and enchiladas. Diana Gonzalez, a co-owner of El Taoseño Restaurant and Lounge, agrees with Vigil about the importance of the chile. They also buy their chile in Hatch and offer the three kinds. They do offer rice, but make it with tomatoes and lemon juice, slightly different from the Mexican kind. 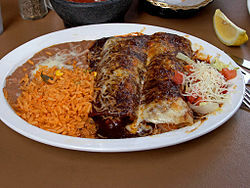 The borracho burrito is one of their traditional New Mexican dishes, which contains grilled beef onions, cheese, guacamole, salsa, sour cream, rice, beans, garnish, and chile. They use green chile, finely diced. El Taoseño’s breakfast burrito includes eggs, bacon, hash browns and, of course, chile. “All our plates are served with rice and beans as well as tortilla or sopaipilla upon request, at no extra charge,” said Gonzalez. Like tortillas, sopaipillas are made of fried flour. Crisp and puffy, they can be served with honey, as a dessert, or just to accompany the main dish, instead of tortillas. There is a lot to choose from. So, be it tacos or enchiladas, burritos or biscochitos, get a taste of the New Mexican cuisine while you are inTaos.